Home Headlines D&D: Xanathar’s Guide to Everything Available Today! D&D: Xanathar’s Guide to Everything Available Today! 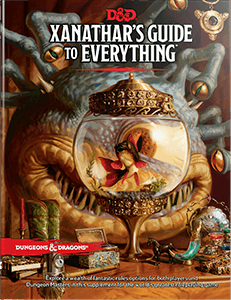 Today marks the wide retail release of Xanathar’s Guide to Everything, the first major expansion for the fifth edition Dungeons & Dragons® fantasy role-playing game. The book provides players with new subclasses for every class in the game, as well as new tools and toys for Dungeon Masters. Anticipation for Xanathar’s Guide has been extremely high leading up the wide release today – it has been climbing up the bestselling list on Amazon, reaching as high as #7 and currently sitting at #9 rank in all books, as well as #4 in Teens and #1 for Games. The beholder called Xanathar—Waterdeep’s most infamous crime lord—is known to hoard information on friend and foe alike. The tyrant catalogs lore about adventurers and ponders methods to thwart them. Its twisted mind imagines that it can eventually know everything! Amid all this valuable lore, Xanathar offers its own bizarre observations about whatever its eyestalks happen to see. Pray they don’t come to rest on you!